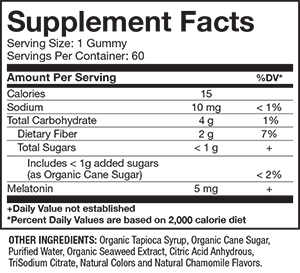 If you are looking for a natural way to improve the quality of your sleep, then these Melatonin Gummies may be for you! The use of Melatonin — a hormone produced normally by your body — to aid in providing healthy, restful sleep is well documented. It is commonly employed not only by a wide range of people struggling with insomnia, but also by pilots and other frequent flyers looking to combat jet lag. You’ll enjoy getting to sleep with these gummies, which feature a natural chamomile flavor, very low sugar, and a robust 5mg of Melatonin. In addition, they are non-GMO, and gluten-free.